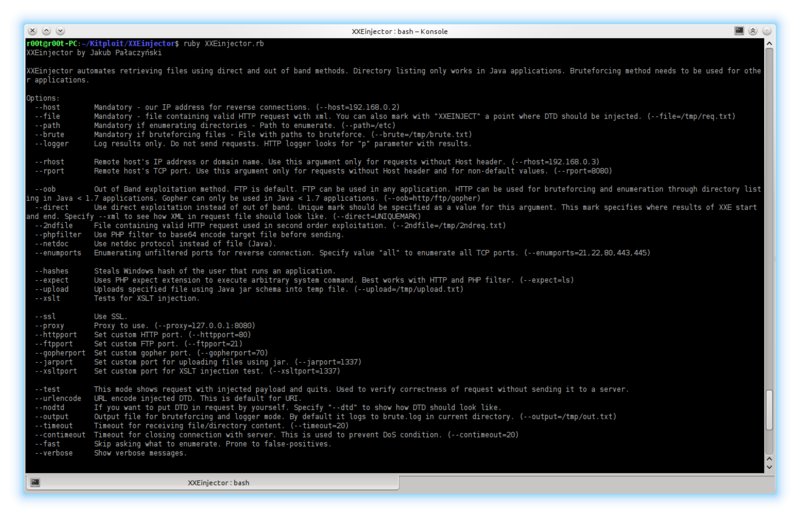 XXEinjector automates retrieving files using direct and out of band methods. Directory listing only works in Java applications. Bruteforcing method needs to be used for other applications. --logger Log results only. Do not send requests. HTTP logger looks for "p" parameter with results. --phpfilter Use PHP filter to base64 encode target file before sending. --hashes Steals Windows hash of the user that runs an application. --xslt Tests for XSLT injection. --test This mode shows request with injected payload and quits. Used to verify correctness of request without sending it to a server. --urlencode URL encode injected DTD. This is default for URI. --nodtd If you want to put DTD in request by yourself. Specify "--dtd" to show how DTD should look like. --fast Skip asking what to enumerate. Prone to false-positives.